Parish Priests and Parish Appeal representatives were invited by the Archbishop to attend pre-appeal tours of the Cathedral on April 21st, 22nd and 23rd. 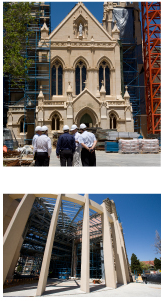 Over 200 members of the Clergy and appeal reps took the opportunity to witness first hand, the magnificent construction and restoration works which have been completed thus far. 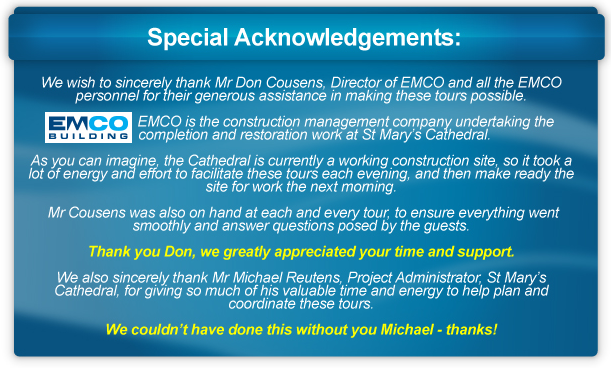 The most common reaction received from guests during the tours was "simply inspirational". Following the tours, guests were invited to the underground car-park, which had been transformed for the tours into a hospitality and presentation area. The Appeal DVD was screened and the Archbishop and Monsignor Keating took the opportunity to inform parish priests and parish representatives of plans for the forthcoming third and final year of the appeal to Parishes & Parishioners. Following the formal presentations, guests enjoyed a cup of tea and coffee, a sandwich and some nibbles before departing for home. There was tremendous excitement and goodwill created as a result of these tours – enthusiasm which we hope will be communicated throughout every parish on appeal weekend.